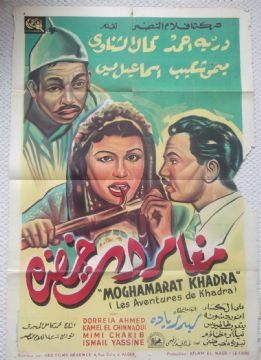 Original 1951 French-Egyptian movie poster from the film ' The Adventures of Khadra ' starring Dorreia Ahmed, Mimi Chakib and Ismail Yassine. This poster is in Fair++ condition and measures approx 32" x 47". This poster has a large piece missing middle right, edge wear and some separations. Beautiful color on this poster and a great restoration project!